Are we ‘lay Dominicans’? Are we simply ‘Dominicans’? How do we best embody the four pillars of Dominican life – prayer, preaching, study and community – to those on the fringes of the church and the broader society? More basically, how can we ‘preach’ so that people experience joy and life? 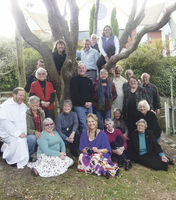 Nineteen women and men from every region of New Zealand prayed, pondered, danced and celebrated answers to these questions at the first national conference of Lay Dominicans held at the Home of Compassion in Wellington from April 30 to May 2. Participants came because of powerful encounters with Dominican sisters and friars who had touched and inspired their lives. Another motivation was deep admiration for the prophetic witness of Waihopai peace activist Peter Murnane who uncovered injustice and championed the tradition of the common good. Touch its centre and make it new! A living tradition becomes new as the charism of its founder holds firm and branches out in creative ways in response to new challenges. Catherine of Siena, Meister Eckhart, Bartolome de las Casas, Francisco de Vitoria and Martin de Porres, to name just a few, touched the centre of Dominican life and made it new by active engagement in their societies and boldly challenging injustice and error wherever it occurred – both in the church and society. From uncovering Treaty injustices to care of the environment, to interreligious dialogue to ‘theology on tap’ (a creative way to be present to young people in pubs), these are some of the ways Dominicans are already prophetic on the fringes of the church and contemporary society in New Zealand. ‘We must learn a new dance,’ suggested Margaret Butler, ‘by moving in different ways to experience the pain, sufferings and joys of those we encounter in our daily lives.’ Grounded in communities of prayer and study, Dominicans will branch out in every profession to people from every race, culture and religion to suffuse these islands with the spirit of Dominic and Catherine. Finally, in response to the question of whether we are ‘lay’ Dominicans or simply ‘Dominican’, Kevin Toomey suggested we contextualise our Dominican vocation within our Christian commitment and then discern how best to embody Dominic’s vision within the lifestyle we have chosen, be it married or single life or a civil union. Special thanks to Mike Kelly and Jenny Wilson for organising the conference and to the Johnsonville Dominican sisters for their invaluable assistance. For more information about the Dominican tradition, contact Mike and Jenny at 06 370 2084.